It's a Wonderful Life (1946) starring Donna Reed (left), James Stewart, and Karolyn Grimes is one of the classic Christmas movies airing on television this week. Fire up your DVRs and pop some popcorn because it's beginning to look a lot like Christmas on American television. This week brings a bounty of old Hollywood Christmas favorites like the classic cartoon How the Grinch Stole Christmas and the holiday B-movie It Happened on 5th Avenue (1947). So, without further ado, here's the list. FYI: the highlighted movies have links to full-length articles. A Charlie Brown Christmas, 8 p.m. on ABC: Charles Schulz's classic characters are having a resurgence in popularity thanks to the hit, The Peanuts Movie. Monday night is a great time to spend with good ol' Charlie Brown and the gang. The night will kickoff with a 50th anniversary celebration at 8 p.m. followed by the classic cartoon at 9 p.m.
Bing Crosby and the Sounds of Christmas, 9 p.m. on getTV: getTV is doing a great job of reviving some of the vintage variety shows. This week they are bringing special holiday episodes from some of the best shows. This 1971 special features appearances from the Mitchell Boys Choir, Robert Goulet, and the Crosby family. This show will also air at 2 p.m. Friday and 10 a.m. Sunday. Merv's Christmas With the Kids, 10 p.m. on getTV: This 1973 Christmas special from The Merv Griffin Show features the legendary host with several child stars, including The Waltons regulars Mary Elizabeth McDonough (Erin Walton) and Eric Scott (Ben Walton). This show will also air at 3 p.m. Friday and 11 a.m. Sunday. Rudolph the Red-Nosed Reindeer, 8 p.m. on CBS: This classic stop-motion animation tale about a misfit reindeer with a bulbous red nose is a holiday classic that has been must-see viewing since it first aired in 1964. It features narration from legendary character actor Burl Ives, who also croons the classic tune, "Have a Holly Jolly Christmas." How The Grinch Stole Christmas, 9 p.m. on NBC: Dr. Seuss' classic Christmas story about the green monster with a heart "three sizes too small" was turned into a 1966 cartoon from animator Chuck Jones. Horror icon Boris Karloff provides the narration and intones the classic song, "You're a Mean One, Mr. Grinch." Jack Frost, 1:30 p.m. on ABC Family: This under-rated stop-motion animation by Jules Bass and Arthur Rankin Jr. tells the story of the lonely woodland sprite, Jack Frost, and his love for a human lady. The Andy Williams Christmas Show, 8 p.m. on getTV: This 1966 holiday special is a family affair with Williams crooning Christmas standards like "Carol of the Bells" and "It's the Most Wonderful Time of the Year" with his then wife Claudine Longet and the Williams Brothers. This show will also air at 4 p.m. Friday and 6 a.m. Sunday. Mitzi Gaynor Christmas Show, 9 p.m. on getTV: This 1967 holiday special features song-and-dance lady Gaynor performing live at Kraft Music Hall in New York City with special guests Ed McMahon, Cyril Ritchard, and Tony Tanner. This show will also air at 5 p.m. Friday and 7 a.m. Sunday. Christmas With the King Family, 10 p.m. on getTV: The King Sisters were a popular sixties quartet, and this 1967 holiday special features the sisters and their families singing holiday standards like "White Christmas" and "I'll Be Home for Christmas." This show will also air at 6 p.m. Friday and 8 a.m. Sunday. 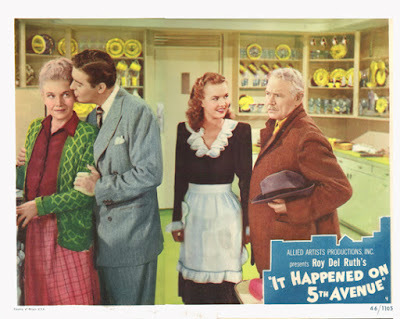 It Happened on 5th Avenue, 8 p.m. on TCM: The classic movie station kicks off its Friday night of Christmas movies with this 1947 B-movie about a homeless bum (Victor Moore) and a World War II veteran (Don DeFore) who stay in a Manhattan mansion while it's owner is in the South. This movie was largely forgotten until it became a YouTube sensation in the 2000's and then began airing on cable TV. Meet John Doe, 10:15 p.m. on TCM: Director Frank Capra's 1941 holiday classic is a timely social commentary about media manipulation and political chicanery starring Barbara Stanwyck as a newspaper reporter who makes hobo Gary Cooper into a populist hero during the Christmas season. Period of Adjustment, 12:30 a.m. on TCM: This 1962 adaptation of Tennessee Williams' play features Jane Fonda and Jim Hutton as a newlywed couple who are having marriage problems on Christmas Eve. All Mine to Give, 2:30 a.m. on TCM: This bittersweet 1957 melodrama starring Cameron Mitchell and Glynis Johns tells the true story of six orphaned children in 19th century Wisconsin who must rely on the kindness of strangers during the holiday season. Little Women, 4:30 a.m. on TCM: This 1949 adaptation of Louisa May Alcott's beloved novel features June Allyson, Janet Leigh, Elizabeth Taylor, and Margaret O'Brien as the March sisters, who are growing up in Massachusetts during the Civil War. The film has many memorable Christmas scenes. The Little Drummer Boy, noon on ABC Family: This 1968 stop-motion animation is another Bass/Rankin classic based on the song about a boy who wants to give the baby Jesus a special present. 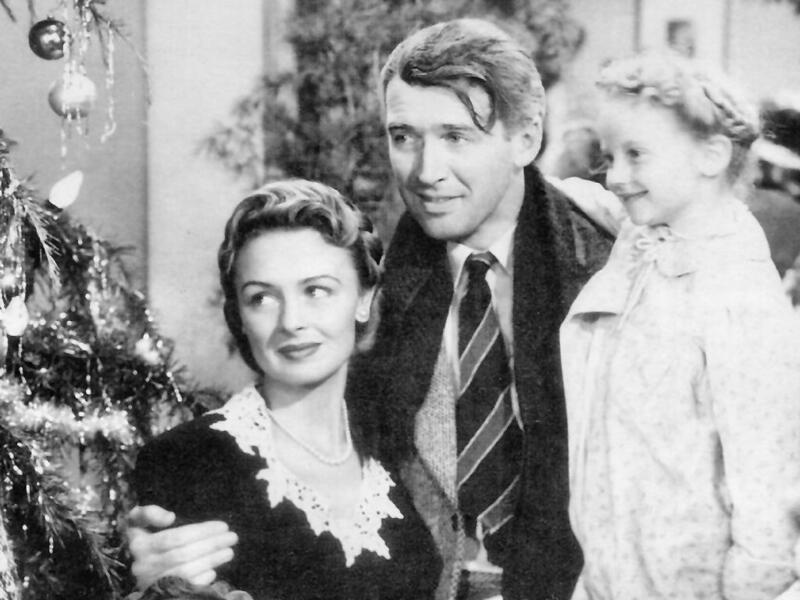 It's a Wonderful Life, 8 p.m. on NBC: Capra's Christmas movie about George Bailey (James Stewart), a down on his luck savings and loans operator who has a life-changing encounter with an angel (Henry Travers) on Christmas Eve, is probably the best known old Hollywood Christmas movie. It's a Wonderful Life certainly deserves it's reputation: it has a brilliant script, some of the best old Hollywood character actors including Lionel Barrymore, Beulah Bondi, and Gloria Grahame, and a gripping lead performance from Stewart. A Christmas Carol, 8:30 a.m. on TCM: This 1938 adaptation of English writer Charles Dickens' classic Christmas story features Reginald Owen as skinflint Ebenezer Scrooge and Gene Lockhart as his longsuffering employee, Bob Cratchit. The Man Who Came to Dinner, 10 a.m. on TCM: This 1941 comedy stars Monty Woolley as an acerbic New York critic who must spend Christmas with an Ohio family after he injures himself on their icy doorstep. Woolley promptly takes over the first floor of the house shouting orders, rearranging the furniture, and firing off classic lines like, "Why are you standing there like the kiss of death?" Holiday Affair, noon on TCM: This 1949 romantic comedy features Janet Leigh as a young woman who must choose between boring businessman Wendell Corey and charismatic ne'er do well Robert Mitchum (It really isn't much of a contest, is it?). Here's good ol' Charlie Brown and company to take us out. See you next week.